The What: QSC has released new software and firmware for the GXD and PLD amplifiers to support the new E Series range of passive loudspeakers. Amplifier Navigator 2.2.5 and GXD Firmware Updater offer the advantages of next-generation advanced DSP settings, providing improved performance as part of a complete E Series Entertainment System. The What Else: Amplifier Navigator V2.2.5 adds the E Series range of loudspeakers to its library of speaker profiles. In addition to loudspeaker tunings, the Amplifier Navigator software enables a user to remotely control and monitor all functions of CXD and PLD amplifiers, including the on-board DSP functionality and amplifier configuration. The software also provides a mechanism to create, store, and recall presets and loudspeaker profiles to and from the PC or Mac. Users can upload specific profiles to connected amplifiers and enable amplifier cloning—ideal for multi-function racks with duplicate amps. It also provides for firmware management: if the user connects one or more amplifiers to a computer running Amplifier Navigator, the firmware will be updated to the latest release. The new GXD Firmware Updater software adds new E Series presets to the GXD operating system, with various settings for each model. Presets include are E10: Stereo E10, Stereo E10 + Sub, Stereo E10 Dance + Sub, E10 Monitors; E12: Stereo E12, Stereo E12 + Sub, Stereo E12 Dance, Stereo E12 Dance + Sub; E15: Stereo E15, Stereo E15 + Sub, Stereo E15 Dance, Stereo E15 Dance + Sub; E18: Stereo E18 Subwoofers. 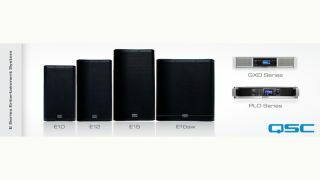 The E Series includes four models, the top-boxes incorporating QSC’s DMT (Directivity Matched Transition), which delivers uniform frequency response across the entire coverage area. The E10 features a 10-inch, die-cast frame woofer with a 2.5-inch voice coil housed in an enclosure that is well suited as a stage monitor or in main PA deployment. The E12 is a trapezoidal, two-way loudspeaker using a 12-inch die-cast aluminum woofer with a 3-inch voice coil and delivers low-frequency extension down to 46Hz, making it a good choice for applications that preclude the use of a subwoofer. The E15 is a trapezoidal, two-way loudspeaker using a 15-inch, 500-watt, die-cast aluminum-frame woofer with a 3-inch voice coil, intended for use when high power and authoritative low end are needed from a full-range loudspeaker. The E18SW is a high-performance subwoofer with a single, high-powered, 18-inch, aluminum-frame woofer, designed to produce powerful low end for live performance with kick drum and bass in the PA or for high-level, high-energy dance music. The Bottom Line: Intended to offer high performance at a value price point, E Series loudspeakers, released earlier this year, are designed for sound reinforcement in entertainment applications, such as live performance, DJ and dance music, karaoke and stage monitoring and production. A software release for the TouchMix Series digital compact mixer featuring DSP settings for the E Series will be available in the future.